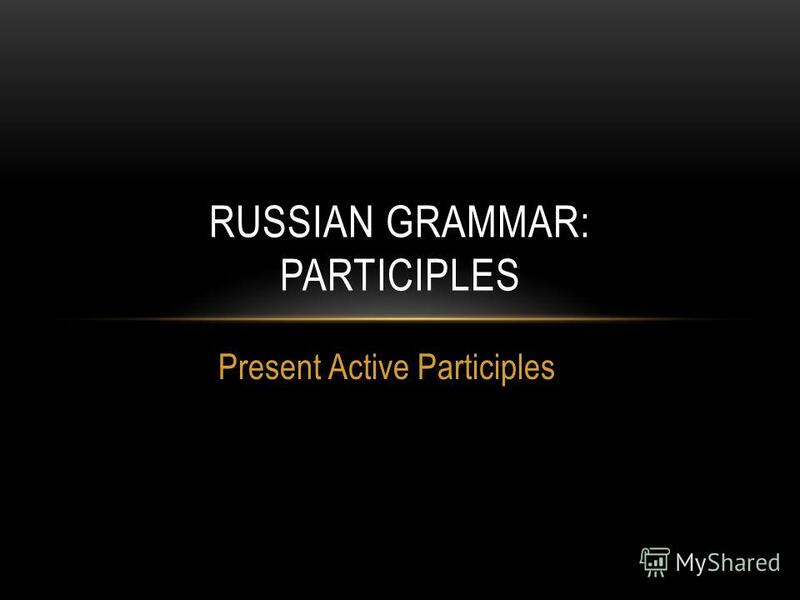 Презентация на тему: "Present Active Participles RUSSIAN GRAMMAR: PARTICIPLES.". Скачать бесплатно и без регистрации. 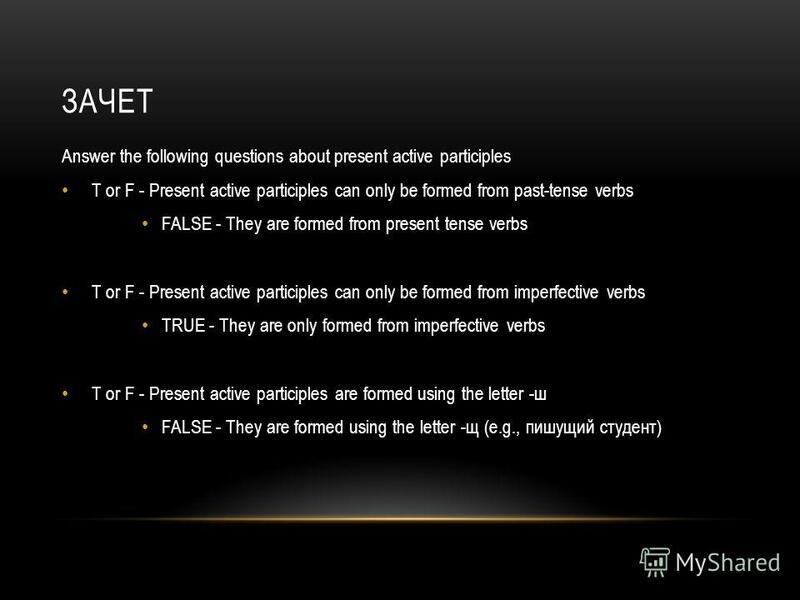 3 WHAT IS A PRESENT ACTIVE PARTICIPLE? Participles are verbs that behave like adjectives in that they describe nouns English examples include: Running water > cf. English verb to run Sleeping children > cf. English verb to sleep Hired hands> cf. English verb to hire Arrested thieves > cf. English verb to arrest Participles are helpful because they allow us to express a lot of meaning in fewer words. For example: The arrested thieves stood trial. Instead of The thieves who were arrested stood trial. It doesnt save a lot of space, but it gives utterance a higher, more erudite style. 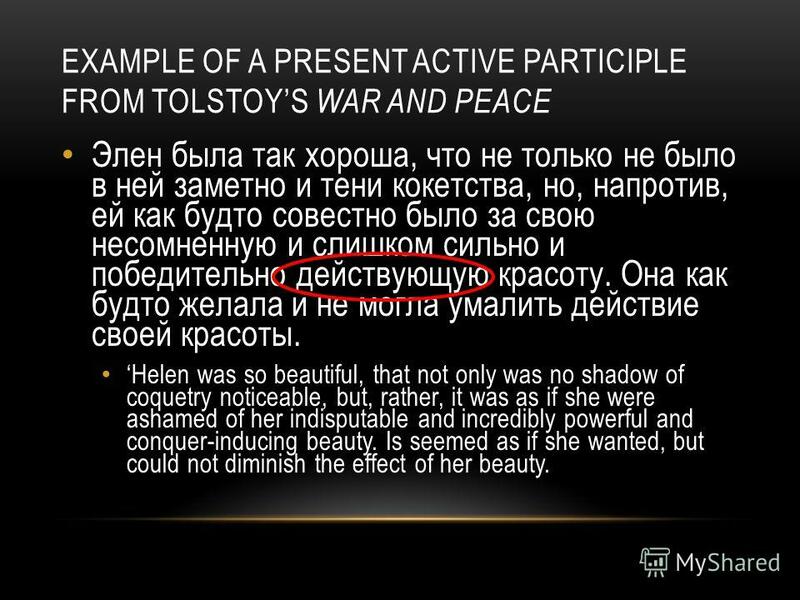 4 EXAMPLE OF A PRESENT ACTIVE PARTICIPLE FROM TOLSTOYS WAR AND PEACE Элен была так хороша, что не только не было в ней заметно и тени кокетства, но, напротив, ей как будто совестно было за свою несомненную и слишком сильно и победительно действующую красоту. Она как будто желала и не могла умалить действие своей красоты. Helen was so beautiful, that not only was no shadow of coquetry noticeable, but, rather, it was as if she were ashamed of her indisputable and incredibly powerful and conquer-inducing beauty. Is seemed as if she wanted, but could not diminish the effect of her beauty. 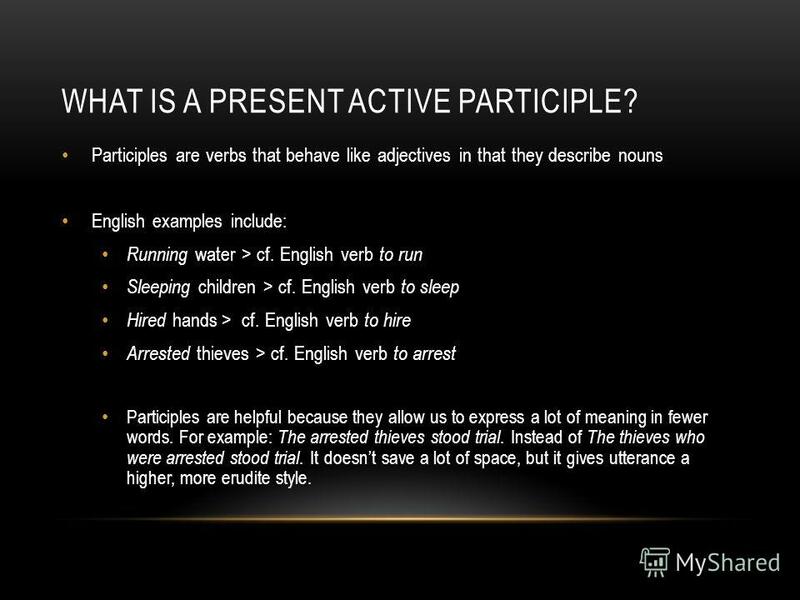 5 WHAT ARE PRESENT ACTIVE PARTICIPLES? 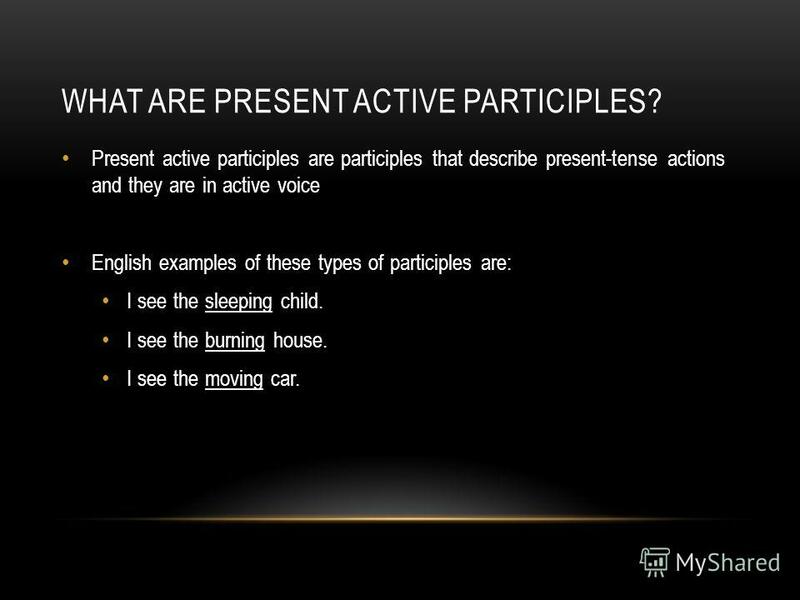 Present active participles are participles that describe present-tense actions and they are in active voice English examples of these types of participles are: I see the sleeping child. I see the burning house. I see the moving car. 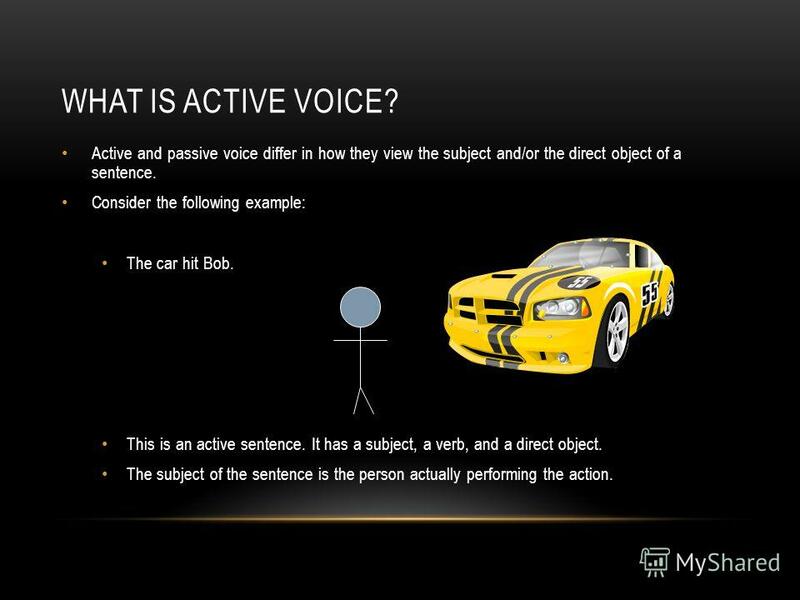 6 WHAT IS ACTIVE VOICE? Active and passive voice differ in how they view the subject and/or the direct object of a sentence. Consider the following example: The car hit Bob. This is an active sentence. It has a subject, a verb, and a direct object. The subject of the sentence is the person actually performing the action. 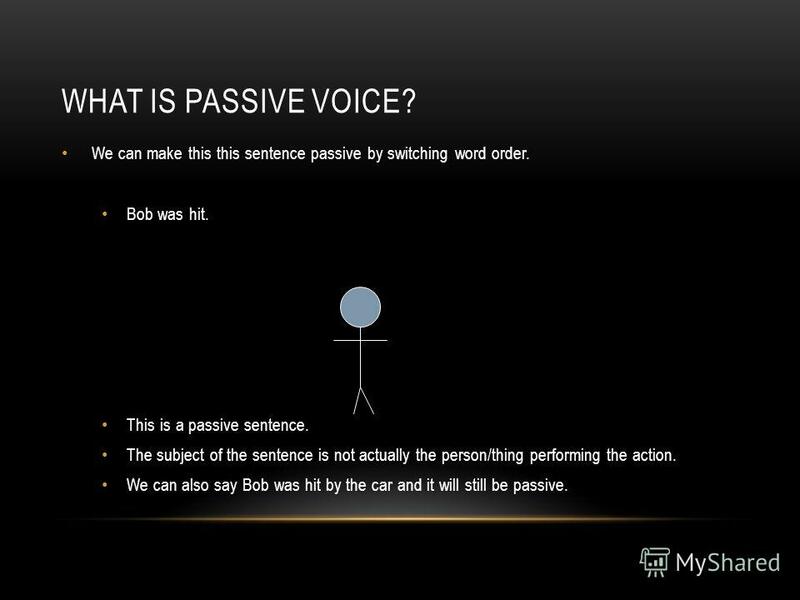 7 WHAT IS PASSIVE VOICE? We can make this this sentence passive by switching word order. Bob was hit. This is a passive sentence. The subject of the sentence is not actually the person/thing performing the action. We can also say Bob was hit by the car and it will still be passive. 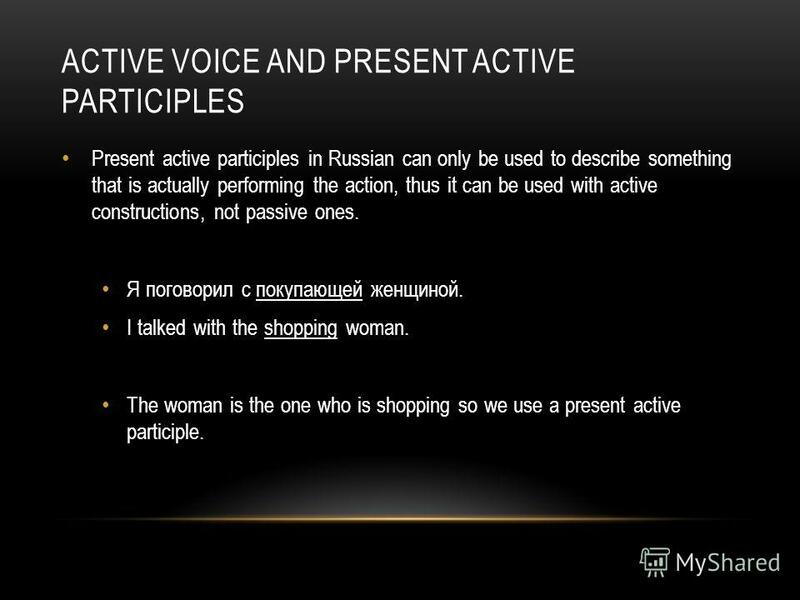 8 ACTIVE VOICE AND PRESENT ACTIVE PARTICIPLES Present active participles in Russian can only be used to describe something that is actually performing the action, thus it can be used with active constructions, not passive ones. Я поговорил с покупающей женщиной. I talked with the shopping woman. The woman is the one who is shopping so we use a present active participle. 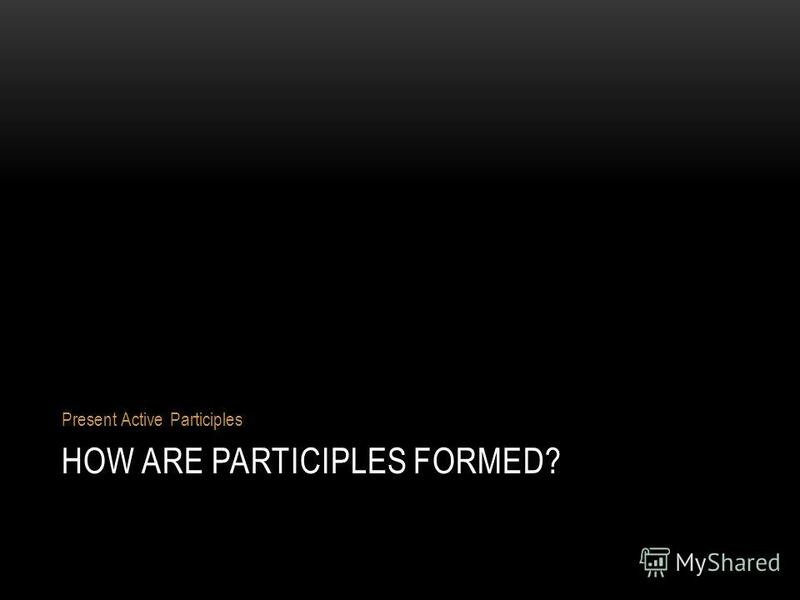 9 HOW ARE PARTICIPLES USED? In Russian participles are typically used in writing, not in speaking. 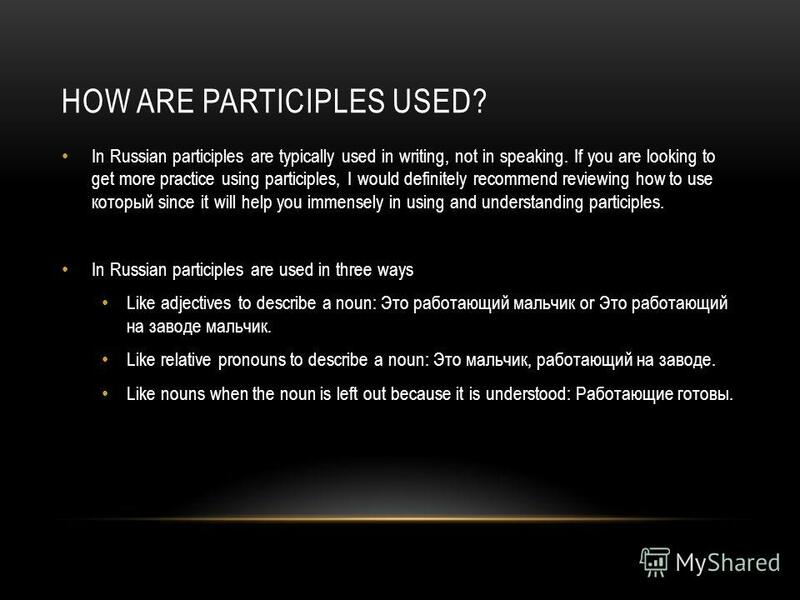 If you are looking to get more practice using participles, I would definitely recommend reviewing how to use который since it will help you immensely in using and understanding participles. In Russian participles are used in three ways Like adjectives to describe a noun: Это работающий мальчик or Это работающий на заводе мальчик. Like relative pronouns to describe a noun: Это мальчик, работающий на заводе. Like nouns when the noun is left out because it is understood: Работающие готовы. 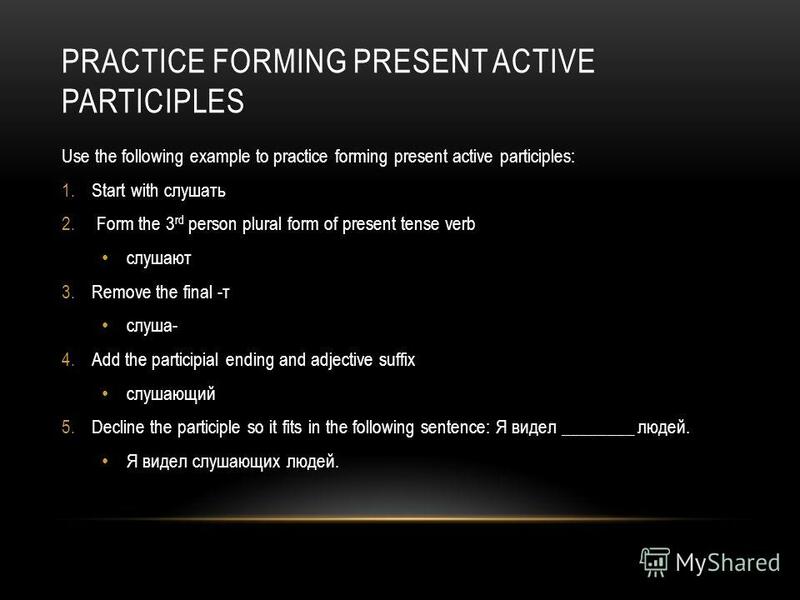 13 PRACTICE FORMING PRESENT ACTIVE PARTICIPLES Use the following example to practice forming present active participles: 1.Start with слушать 2. Form the 3 rd person plural form of present tense verb слушают 3.Remove the final -т слуша- 4.Add the participial ending and adjective suffix слушающий 5.Decline the participle so it fits in the following sentence: Я видел ________ людей. Я видел слушающих людей. 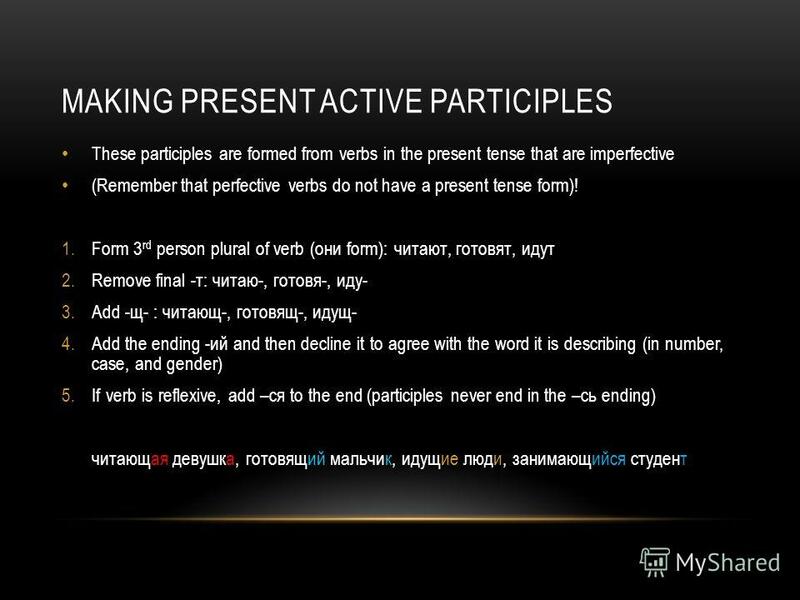 15 CONGRATULATIONS You have now finished this tutorial on present active participles. 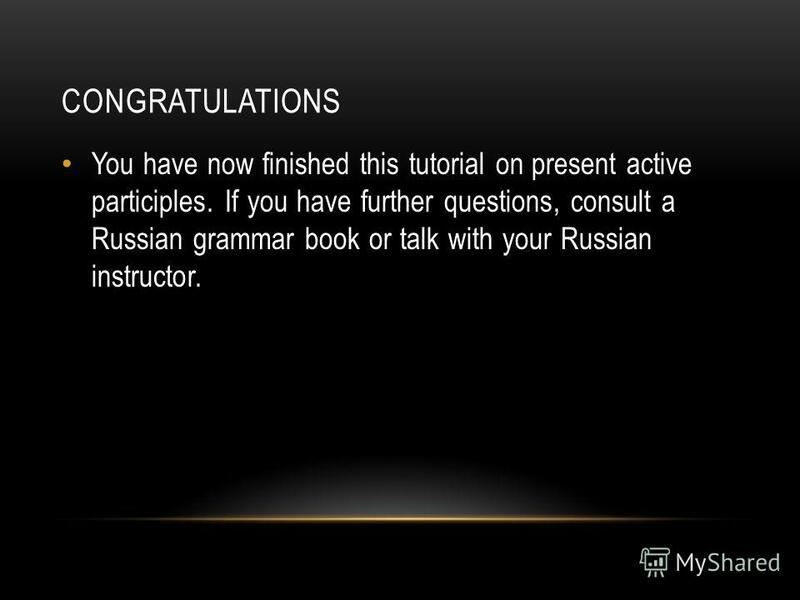 If you have further questions, consult a Russian grammar book or talk with your Russian instructor. Indirect Questions How do you make indirect questions? When do you use this grammar? Grammar Study: Reported Speech Nex t We use the Reported speech: Nex t When we are telling someone what another person said or thought, but do not use. We would like to tell you about our invention. Wonderful inventions have been made in science and technology recently. These are advances are changing. Affirmative I/You have visited He/She/It has visited We/You/They have visited. INFINITIVE CENTRE OF EDUCATION 1443 MOSCOW by English teacher Larisa A. Nuzhnenko. Take one minute to prepare a talk on the following subject. Take notes if you like and remember to include reasons and examples. You should then speak. Present Perfect Experiences Verb Tense used to discuss experiences in the past and completed events and actions up to and including the present time. Contractions Vs. Possessive Pronouns: Three Troublesome Pairs. RELATIVE CLAUSES. Relative Clauses Relative clauses give information about who or what you are talking about. We use relative pronouns like who, which.